When Japanese architect Nikken Sekkei consulted a toilet manufacturer to design a water-evaporating facade for Sony’s new headquarters in Tokyo, the result was far from bog standard. The 25-storey NBF Osaki Home Entertainment HQ features the world’s first evaporative cooling facade, designed by Nikken Sekkei, to cool the surface of the building’s east elevation by up to 12.6°C and the surrounding air by around 2-3°C. The system, known as Bioskin, comprises a network of porous ceramic pipes, similar to horizontal railings. Rain water is collected from the roof, circulated through the pipes, heats up under sunlight and evaporates through tiny holes in their surface. It was invented by three architects at Nikken Sekkei, in collaboration with the practice’s in-house engineering team. Bioskin’s main function is to reduce the ‘heat island’ effect, seen in cities with a lot of heat-absorbing concrete and bitumen surfaces, by cooling the area around the building. If similar facades were installed on several buildings in a neighbourhood, the cumulative effect would significantly reduce surrounding temperatures, its designers claim. The technology has its roots in the ancient Japanese concept of ‘Uchimizu’, the sprinkling of water on gardens and streets to lower ambient temperatures and prevent dust. It is also based on transpiration, whereby water moves through a plant and is evaporated from the leaves, stem and flowers. Nikken Sekkei was unable to find a traditional facade manufacturer willing to work with the plumbing and ceramics required, so the natural choice was to ask Japanese bathroom products manufacturer Toto instead. The collaboration with Toto resulted in architectural innovation in the form of Hydrotect, a thin film photocatalyst applied to the surface of the ceramic pipes, which reacts to sunlight, oxygen and water to keep the surface clear of stains and bacteria without the need for chemical treatments. A similar film is applied to the firm’s toilet bowls. In other words, stains on the surface quickly decompose and lose their adhesive power. They are held in a film of water on the surface of the pipes and then wash away in the rain. The photocatalyst process also breaks down harmful nitrate oxide pollutants into the less harmful substance NO3. Toto estimates that 10,000m2 of applied Hydrotect is able to purify the same amount of air as a forest the size of nine football fields. Rain water used inside Bioskin is held in a 30 ton-capacity reserve tank installed between footing beams in the building’s basement. The supply is large enough to provide 50% of the water needed to fully activate the system during the summer months, the rest coming from tap water, which is relatively cheap in Japan, due to high levels of rainfall. Nikken Sekkei has been monitoring the temperature of activated and non-activated pipes in the Bioskin, measuring surface temperatures and using close-up and airborne thermal camera images. ‘The maximum surface temperature of the Bioskin was 12.6°C lower than a normal facade. We estimate it will reduce the building’s total energy consumption by about 3% by cooling air around office windows,’ says Yamanashi. 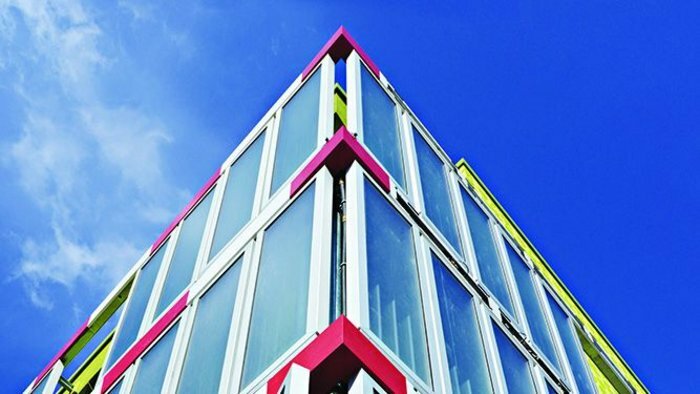 A modified version of Bioskin is being developed by the architect for installation on two unnamed buildings in Japan and it is looking for other suitable projects in Southeast Asian countries with a similar climate.